Welcome to All Sensors “Put the Pressure on Us” blog. This blog brings out pressure sensor aspects in a variety of applications inspired by headlines, consumer and industry requirements, market research, government activities and you. In this blog we’ll discuss air pressure in mattresses and air beds. 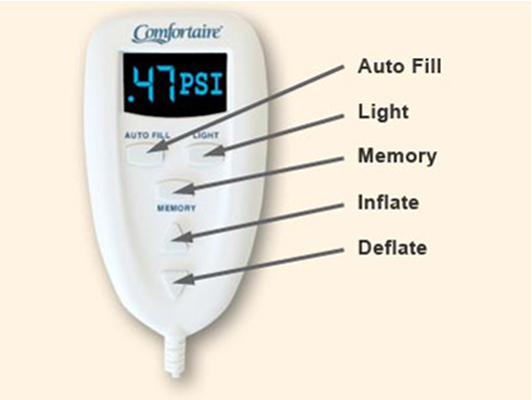 Air mattresses and air beds use air pressure to provide an adjustable comfort level to users. An air mattress can be easily stored in a small amount of space when it is deflated and brought back into service by “simply” inflating it. For users that do not want to use lung power for the inflation process, how much pressure should be applied? Most manufacturers seem to recommend something around 1 psi maximum. For measurement purposes, a 5 psi pressure sensor can easily handle this range. The pump can be built in or external to the mattress or bed. One inflator pump supplier offers a high-volume, low-pressure inflation with a pump pressure of 52 psi and pump volume of 3047 cubic feet/minute. With 1 psi as a max setting, the mattress can be filled quickly and its rating easily exceeded. Air beds that have a dial setting where the user can determine his or her ideal comfort level may have an inappropriate setting if the weather changes significantly. According to its website, “Comfortaire designed the first air bed over 28 years ago.” One of their beds even has a psi reading to determine the right comfort level. Welcome to All Sensors “Put the Pressure on Us” blog. This blog brings out pressure sensor aspects in a variety of applications inspired by headlines, consumer and industry requirements, market research, government activities and you. In this blog we’ll discuss wind pressure and the effect it has on buildings . The forces of nature are beneficial but they can also cause problems. Wind, for example, provides a clean source of power when windfarms are installed in the right place – locations that consistently experience sustained winds sufficient to generate kilowatts of power. In contrast, wind hitting a tall building can cause serious problems. When wind blows against a tall building, it can either go up, around or down. When it goes down, it’s called the downwash effect. One company, CPP Wind was founded over 34 years ago to perform wind tunnel analysis on buildings and structures. Leeds’ Bridgewater Place is a recent example of how downwash winds can turn deadly. In 2011, high winds blew a lorry over and killed a pedestrian. A coroner blamed high winds as the cause of his death. Another even more recent example is a 38-floor structure in London that has been dubbed the “death ray” building. It initially had a problem with intense reflected sunlight. That problem was addressed only to create a problem with wind. CPP works with architects and engineers in the design phase to prevent wind-related problems. When they were not part of the initial design team, CPP can help mitigate preexisting problems. While physical modeling plays a strong role in many projects, it is not the company’s only tool. Pitot tubes in the tunnel verify the created wind profile. “We have to make sure that we are creating the right kind of wind at scale to replicate what we see in the real world,” says Fallbeck. “We also use pressure taps in each of our models to find the wind pressures on the outside of a building to help with the cladding and structural design,” explains Fallbeck. In a typical or standard wind tunnel test as many as 500 to 600 pressure sensors can be used and the 200 to 400 pressure points can be read simultaneously. “We have the capability to do up to 1020 pressure sensors,” says Fallbeck. Pressure transducers in the ±5 inH2O range are used for the measurements and calibrated to report both positive and negative pressures. A section of a building model being prepared for wind tunnel testing at CPP. 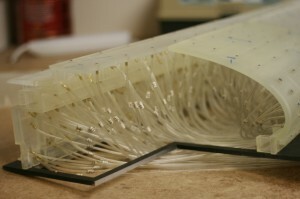 Pressure taps in the surface of the model connect to tubing that feeds into pressure transducers. Courtesy of CPP Wind. This testing helps the cladding engineer keep the building as efficient and resilient as possible and significantly reduce construction costs. Cladding engineers address the outside skin of a building particularly if it is glass. The tests also help the structural engineers to use their materials efficiently and effectively. “We’re talking hundreds of thousands, sometimes millions of dollars’ worth of materials,” insists Fallbeck. Analysis that addresses wind at the base of the building to minimize ground level effects on pedestrians is another matter. The proprietary probe is a tool that is used in the wind tunnel as well. A combination of site analysis, architectural drawings, Google Earth, and photographs allows CPP Wind engineers to determine the features that interact with the wind. “We look at the wind environment using local anemometers so we can see what the meteorology is there, what kind of wind conditions exist, and how the winds will affect and be affected by the buildings and terrain in that area,” says Fallbeck. Using that information, CPP Wind can verify that a pedestrian wind problem could occur or does exist and determine how to mitigate it. Pressure sensors are an integral part of several types of wind tunnel analysis that CPP performs. 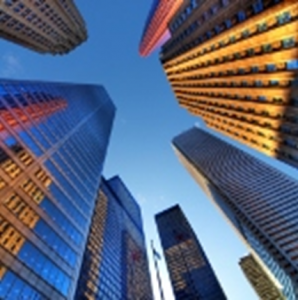 “Pressure sensing saves the building industry millions and millions of dollars every year,” concludes Fallbeck.